East Texas Ranch is a registered Brahman Cattle operation and was started in 1975 by G.B. Chamblee and his son Roy Gene Chamblee. Roy's sons, Mark and Richard Chamblee took over the daily operations in 2005. East Texas Ranch is located in Huntington, Texas, which is about 10 miles South of Lufkin and 120 miles Northeast of Houston. 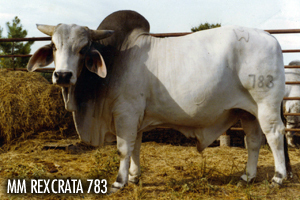 East Texas Ranch's first herd bull was Sugarland's Poncrata 57. He was a son of the 1972 National Grand Champion bull, Sugarland's Poncrata 4. This bull produced a large number of our cattle. Our next herd bulls were MM Rexcrata 783 and E-TEX Rexcrata 93. Both were sons of the great Sugarland's Rexcrata 1 229. In 1984, Roy Gene added another great herd sire, +WR MR. SUVA 203, who is currently the #1 brahman bull in the Register of Renown. In the 1980's we were breeding grandaughters of the #2 Brahman bull in the Register of Renown to the #1 Brahman bull in the Register of Renown. East Texas Ranch was less active in the 1990's. Hereford and Simmental bulls were used on the ranch. As a result, most of the Brahman herd were phased out. In 2004 Roy began breeding Brahman's again and purchased Ban Bar Manso 299/2, a full brother to the 2002 International Reserve Grand Champion bull, BNA "The Deacon" Manso 253. He was used on the ranch until 2009. 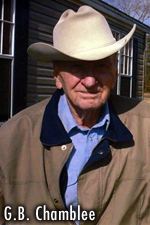 In 2007, Mark Chamblee of Huntington and Richard Chamblee began purchasing cattle for their ownherds. East Texas Ranch purchased a couple of heifers from the JDH Locke Division. In 2009 they added Mr. V8 759/6 “ACE”, a son of the great +Mr. V8 287/5 “Superstroke”. His dam $Miss V8 910/4 is one of only 12 Vanguard cows in the Brahman breed. Mr. V8 759/6 is a full brother to the 2005 International Champion +Miss V8 228/6. 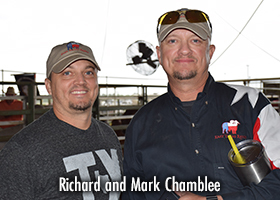 In 2010 Mark and Richard took over ownership of East Texas Ranch where they combined the herds and changed the brand from the original C- to the Texas Shape brand. In March 2015 we purchased JDH Mr. Pedro Manso 974/4 from JDH Locke Division in partnership with Jeremy Loewen of 4L Cattle. Pedro is a JDH Hawk Manso 666/5 son out of a +JDH Mr. Elmo Manso 309/4 cow. We don’t believe there is a Brahman bull out there that produces gentler calves than Pedro. We had started keeping so many of these great Pedro heifers that in March 2018 we purchased another great herd sire from JDH Hudgins Division, JDH Munroe Manso 54/9 to cross with the Pedro heifers. Munroe is a JDH Beckton De Manso son out of a (+)JDH Sir Lawford Manso 616/6 cow and is a full brother to JDH Popeye Manso. East Texas Ranch recently started purchasing registered Beefmaster cows for our new Beefmaster herd and our embryo transfer program. We currently have embryos out of one of our best donor cows Miss E-Tex 63/2 and Mr. V8 960/5, the 2006 International Grand Champion Bull. East Texas Ranch has always been a grey Brahman operation but we have made plans to start our new Red Brahman division and purchased embryos from Moffit Cattle Company out of CT Lady Adalida 10/6, a Mr. V8 380/6 x CT Lady Rhineaux Ray 8/9 cow and KC Apache 707/4. We look forward to growing our Beefmaster and Red Brahman Divisions.